Inorganic Polysiloxanes: Typical inorganic polysiloxanes cure by hydrolytic polycondensation. Formulated with the proper selection of additives and pigments, coatings can resist temperatures of approximately 1,400°F (760°C). Variation of pigment creates coatings with excellent solvent resistance. Epoxy-Polysiloxane Hybrids: Formulation with aliphatic epoxy resins, silicone intermediates, oxysilanes, and aminosilanes creates weather and corrosion-resistant hybrids. These coatings cure by both hydrolytic polycondensation and more conventional epoxy-amine mechanisms, resulting in what are known as interpenetrating polymer networks. The resulting formulations provide improved resistance to weathering over conventional epoxy coatings. Acrylic-Polysiloxane Hybrids: By combining acrylic and siloxane resins, a low VOC, highly weatherable topcoat is produced. These systems can be produced as one- or two-component systems. New chemical variants in polysiloxane coating chemistry are continuing to be developed at a rapid rate. Each manufacturer of polysiloxane coatings makes a compatible primer and intermediate/tie coat. 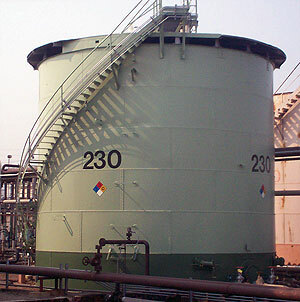 PolySiloxane Coatings are used on structural steel, steel tanks, barges, refineries, petrochemical plants, power plants, railcars, pulp & paper mills, masonry surfaces and others as recommended.